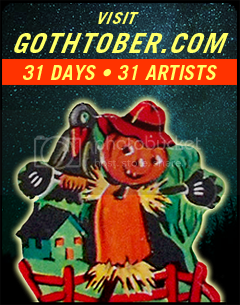 Gothtober applications are closed, Gothtober contributors have been picked and they’re all boiling and toiling in their laboratories with creativity, we will see their works starting Gothtober 1st! Which brings me to the subject of Halloween candles and candy corn products. Some of you are “blood and guts” type Hallowen people, some of you are “Pumpkin and Fall Leaf” Halloween people. I, myself, am both. I can see merit in a severed hand candle on book case, or a lovely wreath of shiny black feathers adorning your front door. I used to really like the store “Illuminations” and felt that, out of all the retail-smelly-candle stores, this was the one that spoke to me. Unfortunately, “Illuminations” didn’t survive the great 700 Billion Dollar debacle of 2008 and was taken over by Yankee Candle. I feel like Yankee Candle is more for people who like baskets or linens, but maybe I’m wrong. 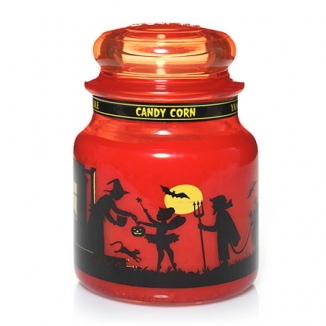 I could be wrong, because despite it all, I do find this Candycorn-scented candle to be intriguing and acceptable. I was a little freaked out, however, to find that it doesn’t just stop at candles. You can purchase candycorn car vent sticks, air fresheners and wax melty thingers. The 65-95 hour candle will cost you about twenty-five bones, and the votives are $1.99 each. 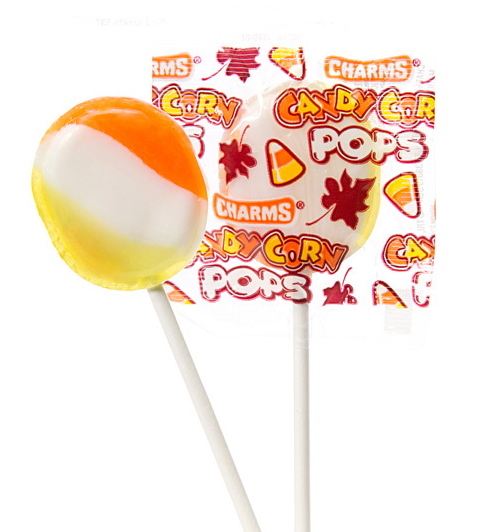 If you don’t want to smell candy corn, but you want to taste it, and you’re looking for an experience outside of the usual candycorn regimen, might I suggest Charms Candycorn Pops? It’s $3.95 for a bag of 15 edible conversation starters.